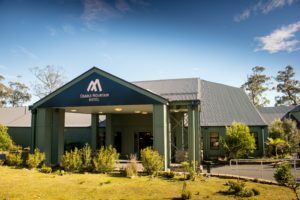 Accommodation at the conference venue, Cradle Mountain Hotel, is now fully booked out on Saturday 11 August 2018. If you have not booked accommodation for the conference dates, please see below for other accommodation options in the Cradle Mountain area. To book rooms at the below hotels, please contact the hotel directly. There are a number of other accommodation options in the Cradle area. Few are within walking distance of the Conference Venue so please be sure you are aware of this prior to booking. The list below is in order of nearness to the Conference Venue, Cradle Mountain Hotel. 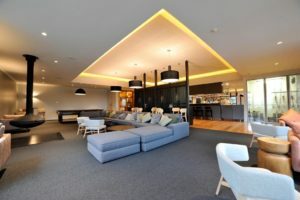 Rooms have been reserved for delegates at the conference venue, Cradle Mountain Hotel, and room types and prices are listed below. These can be booked when registering for the conference. 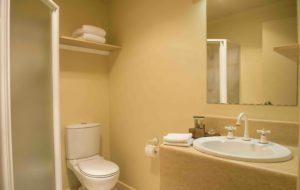 All rates are per room, per night and do not include breakfast, unless otherwise specified. Please note the cancellation policies listed for the hotel. 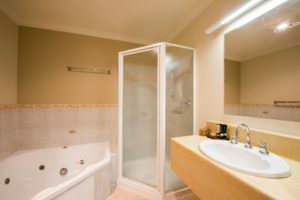 Cancellations and no-shows will attract a fee of at least one night’s accommodation. 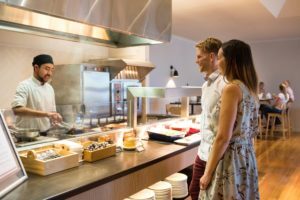 However, each hotel’s policy varies and late cancellations and no-shows may be charged for all the nights booked. Bus transport to and from Cradle Mountain and Lake St Clair visitor centres is available all year from Hobart, Launceston and Devonport.. Check with the operators listed below for scheduled services and charter arrangements. Cradle Mountain lies at the northern end of the Cradle Mountain-Lake St Clair National Park. It is 1½ hours from Devonport via the B19 and B14 south to Sheffield, then C136 and C132 to the park entrance. From Launceston, it is a 2½ hour drive on the Bass Highway (A1), then the sign-posted route via B13 and C156 through Sheffield. From the west, drive 2 hours along the A10 and C132 from Queenstown or 1½ hours from Burnie via B18 through Ridgley, then the A10 and C132 to reach the park. There is no direct road link through the Cradle Mountain- Lake St Clair National Park to join the two ends of the park. 3718 Cradle Mountain Rd, Cradle Mountain TAS 7306. 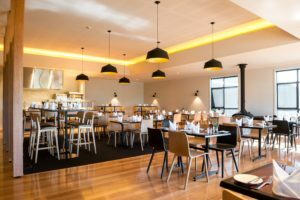 Nestled within breathtaking alpine forest in the central highlands of Tasmania, Cradle Mountain Hotel offers you an inviting home away from home to unwind after a day of exploring our pristine Tasmanian wilderness. Tasmania’s picturesque World Heritage Area at Cradle Mountain will have you ready and raring to explore Cradle Mountain Lake St Clair National Park and the iconic Boat House at Dove Lake; all just a stone’s throw from the hotel. Get active in the clean mountain air and meet the friendly, furry locals – say hello to the echidnas, wombats and wallabies that roam the hotel surrounds. 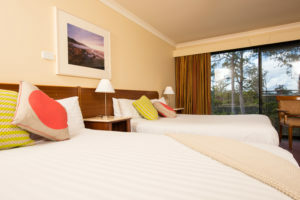 Nestled within scenic forest, Cradle Mountain Hotel offers a variety of accommodation − including stylish and comfortable Standard Rooms, Deluxe Spa Rooms and Split Level King rooms. Each room is warm and cosy and has all the mod cons; you will love coming back to snuggle in and instantly feel blissfully relaxed. 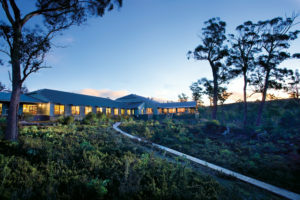 The accommodation gives you room to relax and unwind and is the perfect escape for your holiday in Tasmania. Any cancellations made within 48 hours of check-in will incur full costs. 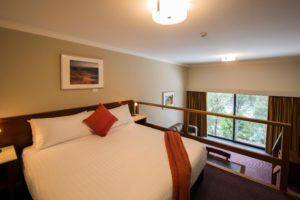 Cradle Mountain Hotel’s comfortable and spacious standard rooms are perfect for couples or families planning a Cradle Mountain wilderness experience. Our standard rooms provide a welcoming and comfortable base for your wilderness holiday. Each standard room includes a queen bed and king single bed, and your own private balcony to watch for native wildlife foraging in the bush. Indulge yourself at the end of your day’s adventures in one of the Hotel’s deluxe spa rooms. These luxurious suites feature twin double beds and a corner spa bath—perfect for a romantic alpine getaway. Sink into a reviving spa after a day of hiking, or surrender to the warm comfort of your bed and watch the colours change over the forest outside your window. 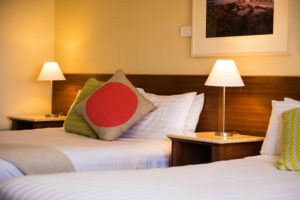 Spoil yourself in Cradle Mountain Hotel’s premier room, the split level king spa. These well appointed rooms feature a king bed, a sunken lounge and study area with views to the surrounding woodland. Your living area, located on the suite’s lower level, is spacious, welcoming and the perfect spot for admiring the view. Double sliding doors open onto your private portico where you can breathe the crisp mountain air and fragrant alpine forest. Unwind after a day exploring the national park, and sink into your king-sized bed, located in your suite’s upper level.